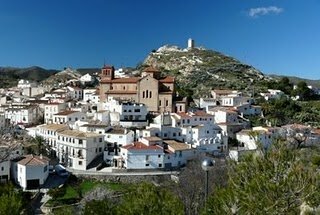 Lubrin is one of the small and typical Spanish towns in the Sierra de Los Filabres hills, about one hour's drive from and due north of the large, Mediterranean coastal town of Almeria. Unlike the "white villages" in the western part of Andalucia the architecture incorporates many stone buildings as well as the whitewashed Moorish style buildings. We visited Lubrin in 2003 and apart from an increased sense of affluance, it has hardly changed in that time. The town is hidden in a fold of the foothills and as the locals say, if you blink you will miss it. Perhaps that is why it still retains that old world Andalusian charm, and has managed to retain its small shops, among them two bakers, a tailor, hardware, grocery, farmacia, bank and post office. The tracks (Ramblas) leading out of the village act as gateways to the Filabres hills, with miles of unspoilt walking and mountain biking, winding through the valleys and climbing to peaks in excess of 1000m. 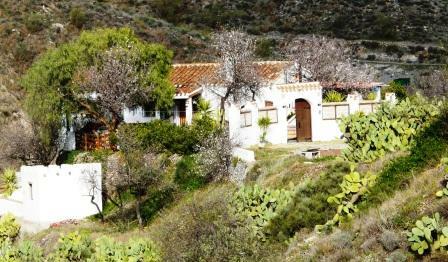 Throughout this region there are many almond and olive groves in terraces up the hillsides, interspersed with Prickly Pears, Aloe Vera and other cactus types. 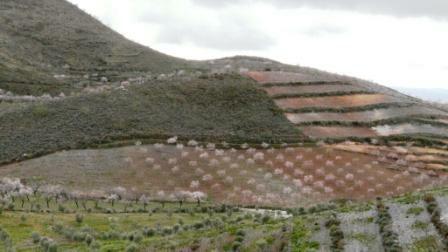 At this time in January the almond blossom is bursting giving the trees a pinkish hue. 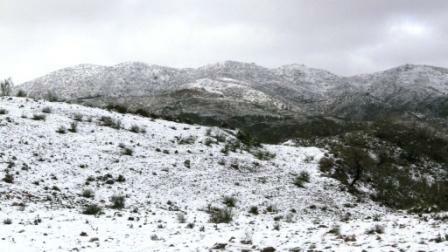 The area is the only officially designated desert in Europe and hence there is little rainfall. 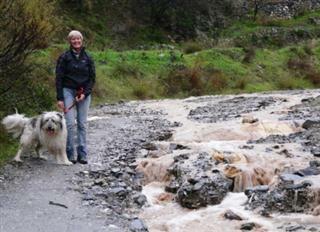 When it does rain the heavens open sometimes lasting for 24 hours or so. Previously bone dry Ramblas are briefly turned into raging torrents, which gouge out deep cuts into the track surface, making it unpassable until the "grader" comes along to restore the surface. The patron saint of the village is San Sebastian. We had arrived in time for the annual saints day and the Fiesta del Pan or bread festival. The exact origins of the festival are shrouded in folk lore, but it is known that it incorporates elements connected to the Christian / Moorish conflicts and the times when plague spread to the area. The following excellent description is taken from Levante Lifstyle. 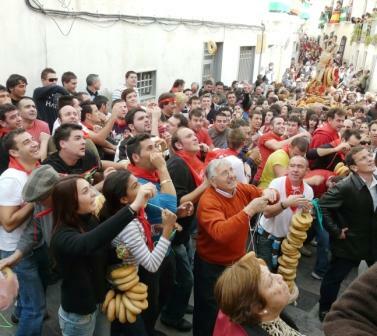 "Every year on 20th January, the town is the scene of a boisterous ‘bun fight’ - the highlight of the three-day day Fiesta del Pan (Bread Fiesta). The peal of the church bells and an explosion of rockets kicks off the no holds barred event following a special midday mass.The crowd roars as the image of San Sebastián, one of the patron saints of Lubrín, emerges from the church adorned with fake bread rolls, and trailed by the town band begins a slow parade through the packed, narrow streets of the town. Young and old “rosqueros”, sporting red bandanas and bellowing football terrace-like chants, vie to catch “roscos” - large, doughtnut shaped rolls - which “lanzadores” vigorously hurl from the windows and balconies above. The successful catchers then triumphantly thread their snatched trophies onto cords and dangle them around their necks. Once the noisy jostling for the roscos and processions are over, and the ‘necklaces’ have been proudly displayed in the streets, the revellers come together for snacks of bits of bread, tuna, anchovies and cold meats. 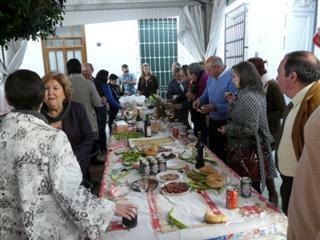 In May 2003 the Junta de Andalucía recognised Lubrín’s particular version of the Bread Fiesta with a Tourism Interest classification, the event attracting 8-10,000 intrigued visitors every year. The exact origins of the fiesta in Lubrín are not known for certain, but one version of the story is that centuries ago the area was blighted by cholera, plague, starvation and other natural disasters. 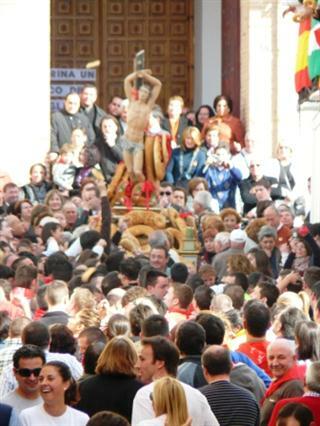 The people appealed to San Sebastián for protection and salvation, staging a procession in the saint’s honour through the town. The threat of disease and blight lessened, and the good folk of Lubrín took it as a clear sign that San Sebastián had answered their call for help. In thanks for the saint’s intervention, the most affluent in the town began giving food to the neediest, throwing down their charitable offerings from the upper floors of their houses to make sure they didn’t become infected with disease". There are lots of lovely walks and cycling routes around the area. In the spring the almond blossom covers the trees. Link back from Lubrin to Time Out page.